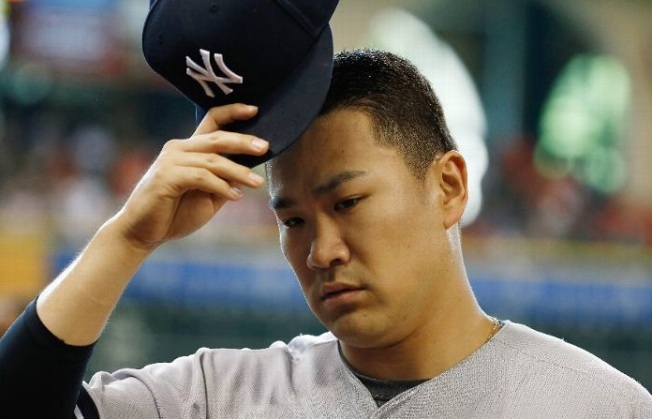 Yankees starter Masahiro Tanaka gave up six runs after being staked a six-run lead. Brian McCann hit a grand slam and Chris Young homered to give New York an early lead, and Mark Teixeira had a tiebreaking two-run double in the eighth after the Yankees squandered that cushion in a 9-6 win over the Houston Astros on Saturday. McCann's slam came in the first. A two-run shot by Young, a Houston native, that extended his hitting streak to a career-high 10 games, in the second off Houston starter Brett Oberholtzer put the Yankees up 6-0. Oberholtzer was ejected with one out in the second inning for throwing at Alex Rodriguez and the Astros got going on offense after that. Chris Carter and George Springer each drove in a run in the second before Carter homered in the fourth to cut it to 6-3. Rookie Carlos Correa hit a two-run homer in the fifth and Jose Altuve connected on the next at-bat to tie it up.